After that instant, the only significant receipt info which remains unmasked is the price, 768.94 €. Is there a verifiable reason the exact nature of this purchase is almost hidden from the viewer? In the English subtitles, Yuri refers to it as simply a "luck charm". There is a Tumblr post which explains that the term in Japanese is "omamori" and has a deeper meaning than a non-Japanese speaker would associate with "luck charm". (I have no direct knowledge that this post is accurate, but it feels right.) So those in Japan would apparently get much more out of this scene, even if they could not read the receipt. Within hours (probably minutes) of episode 10 airing, there were people posting the information on this receipt. It is likely that, even though the details would slip by the vast majority of viewers, any internet-savvy YoI fan would know what the receipt said. So the scene seems to be intentionally hiding information, but with the knowledge that it will be revealed by the fans. Does this confuse anyone else? Was the text of receipt hidden, and why? I didn't get the impression that the receipt was anymore intentionally "hidden" than, say, Yuko's text message to Yuri Plisetsky in episode 4; I saw the text of the receipt as simply there to fill in necessary visual details (in the same way in which it might be necessary for books or pages of homework in the "background" of other anime to contain some relevant text). 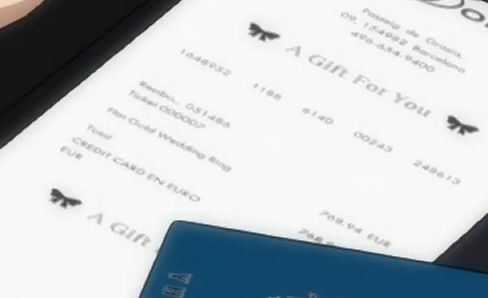 However, the text of the receipt does affect how we perceive Yuri's intentions or the scene where rings are exchanged, so one could argue that at the very least, useful information is being unintentionally hidden (by virtue of the fact that this piece of information is more or less a background detail). I haven't seen (at the time of writing) any discussion of the text of the receipt in (translations of) the "official" discussions listed here, so it's difficult to go beyond guesswork in thinking about these issues. What does the receipt say? My best guess is that the receipt reads "Flat Gold Wedding Ring". This is prompted both by the observation that other people have made the same guess and that "Flat" was my first guess of an English word that could fit the context. Originally, I was uncertain about this reading, as the final character in the first word did not look like a lower case T to me; as a lower case T, it seemed too short. However, upon a second look, I noticed that instances on the receipt where there is clearly a lower case T in the same font (i.e. in the instances of "Ticket" and "Total" that we see) have the same problem. With this in mind, I was able to throw out my objection. Not the answer you're looking for? Browse other questions tagged anime-production yuri-on-ice or ask your own question. Why was there never a dub for Skip Beat? Why do characters in some art styles have a broken line for mouths? Why was the kiss not shown?